Spinach is considered as a super-food, nutrient dense when you eat it raw, but it retains more vitamins with some cooking methods. For maximum vitamin retention, use quick-cooking methods that do not include water, such as sautéing, stir frying or blanching to reduce the amount of nutrients lost from cooking. Now add finely chopped spinach, peas and saute for 4-5minutes. Turn off the flame add lemon juice give it a toss. If bulgur is soaked in hot water it doesn’t take much time to cook. 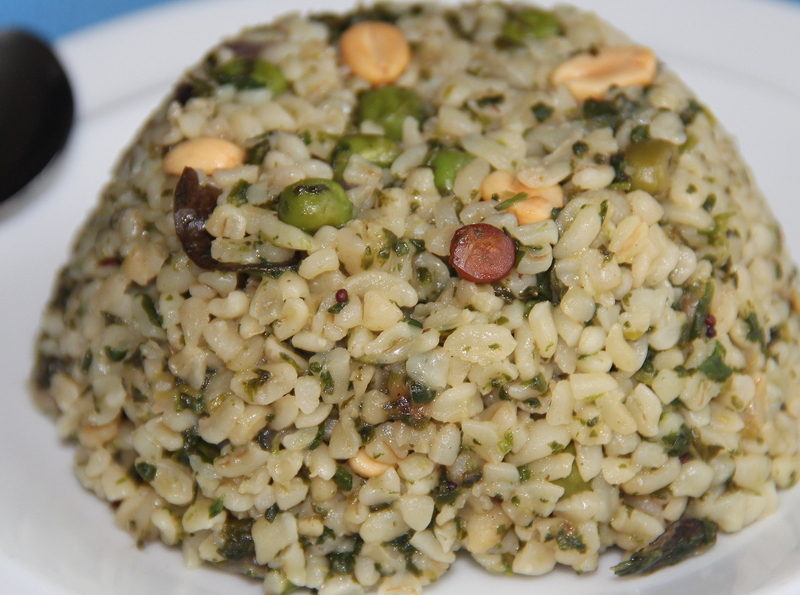 If there is excess water in soaked bulgur just drain and then add it to the spinach mixture. Posted on June 22, 2014, in Indian, Main dish and tagged Bulgur rice recipes, Chitras healthy kitchen, drchdietfood, Indian rice dish, Spinach rice recipe, Spinach stirfry rice. Bookmark the permalink. 2 Comments. Sounds delicious with all those spices. Beautiful presentation too! Thank you..I wanted to try a quick recipe using Bulgur and this came out well.